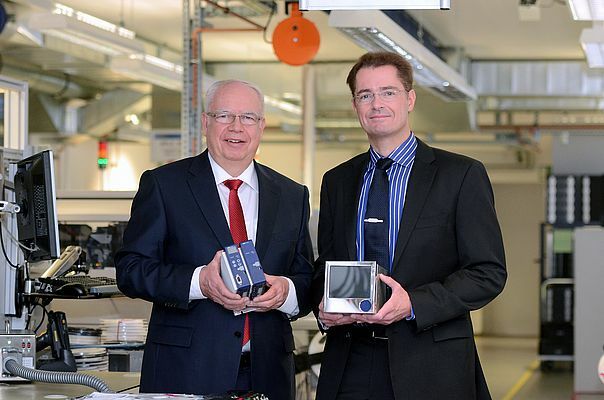 JUMO's joint CEOs Bernhard (left) and Michael Juchheim (right) can look back over a successful fiscal year. "Our progress in the past fiscal year was very pleasing. Despite a challenging market environment in Europe, we increased our revenue from EUR 205 million in 2012 to EUR 218 million. This means that our revenue has grown by over 20 percent since 2010," explained Bernhard Juchheim, CEO of the JUMO Group. JUMO Deutschland's revenue was up 6 percent on the previous year at EUR 161 million, while the subsidiaries grew by 8 percent. At the end of last year, the orders in hand amounted to nearly EUR 44 million. The company's export ratio remained stable at 54 percent, some 2 percent higher than the industry average in Germany. "We are continuing on our successful course as a high-tech supplier of sensor technology and automation and are opening up more and more markets around the world with our innovative products," added Michael Juchheim, who manages the company as CEO alongside his father. At the end of 2012, the JUMO Group employed 2,140 people worldwide, 6.5 percent (or 131 employees) more than the previous year. "This considerable increase in staff numbers has been a deliberate decision to preserve the expertise of our workforce," emphasized Bernhard Juchheim. This is, he said, because the fight to attract the best workers is now an issue affecting the whole industry, not just the skilled manual trades. A total of 1,284 people were employed at the Fulda site, of whom 105 were apprentices. The other subsidiaries and offices in Germany employed 43 staff, while 813 held positions in the subsidiaries abroad. The percentage of apprenticeships at JUMO remains above average, with 31 new apprentices, BA students and one-year interns being taken on last year. Turkey is one of Europe's fastest growing markets. Since 2002, its gross domestic product has increased by an average of some 6 percent each year. JUMO has had its own subsidiary on the Bosphorus since 2008 and has been able to benefit from Turkey's economic miracle in the energy and sewage technology sectors in particular. As a result of the rapid growth, the former premises were no longer large enough, so in June new offices six times larger than the old ones were acquired. The JUMO Group has made a clear commitment to above-average growth and plans to increase its revenue by 9 percent to EUR 237 million in 2014. Based on how business has been going in the first few months, Bernhard and Michael Juchheim believe this target to be a realistic one.